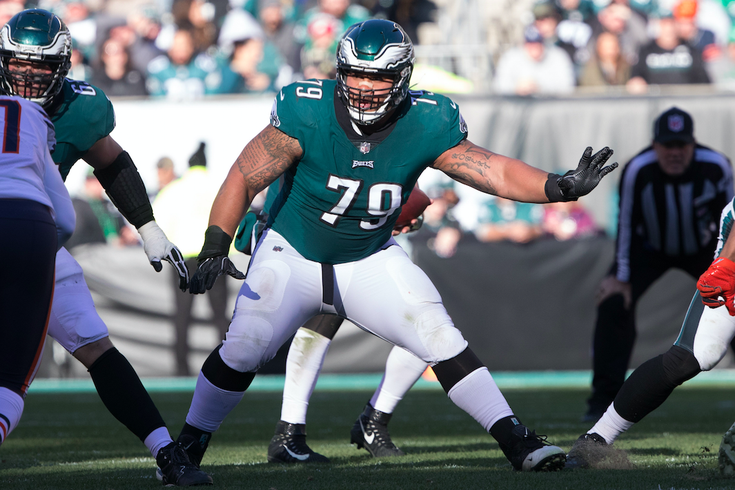 Philadelphia Eagles offensive guard Brandon Brooks in action against the Chicago Bears at Lincoln Financial Field on Nov 26, 2017. An NFL offseason marked by ridicule and speculation about the sturdiness of the New England Patriots empire shows no signs of slowing down. The avalanche began with post-Super Bowl comments from Eagles left tackle Lane Johnson, who said New England's system is robotic, joyless and based on fear. After taking criticism from former players, Johnson clarified that his remarks came in the context of alleged Patriots trash-talking against head coach Doug Pederson and owner Jeffrey Lurie. Earlier this week, Johnson's impression was confirmed by at least one former New England player. San Francisco 49ers defensive end Cassius Marsh, who spent less than three months with the Patriots last summer, said there was "nothing fun" and "nothing happy" about life in Foxboro. Now the latest salvo comes from Eagles Pro Bowl guard Brandon Brooks, who explained why he's not a fan of the "Patriot Way" after OTA's on Tuesday. While a member of the Houston Texans, Brooks played under Bill O'Brien, who formerly served as Bill Belichick's quarterbacks coach and offensive coordinator. Brooks was eventually cut off by Lane Johnson, who again explained that while championships are obviously the ultimate goal, NFL players will eventually look back on their careers and remember the team environments in which they worked. They'll value the friendships and the thrill of competition more than the number of rings they have stuffed away in a box. It's probably time to turn the page on this narrative, which will play itself out next season when we learn whether the apparent turmoil in New England spills into the the team's chemistry on the field. If they've been miserable for 15 years already — and still winning — then it's probably going to be a lot worse if the wheels come off in the aftermath of Super Bowl LII.